It breaks my heart whenever I see a post about a missing beloved toy. Last year there was a story that went viral about a bunny (different than this one) that had been left behind at a hotel. The staff had some fun with it, posing the rabbit enjoying its extended stay, with spa treatments and choice dining room seating. This and other stories like it show how many people understand how very important these special items can be. Some of my children had lovies and life would have been different without them. Although there was a considerable hassle when one went missing or was left behind, they were able to soothe tender feelings even better than I could. These items provided reassurance in a sometimes scary and unpredictable world. 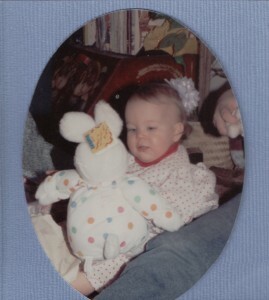 The first beloved object in our family was a white bunny with pastel polka dots and a clown ruff at its neck. We thought it was fortunate that this item was chosen, because by pure chance, I had received two identical stuffed rabbits as baby shower gifts. We had hit the jackpot! We could rotate the items when washing was necessary, without tears from being without the precious toy. When I found another very similar bunny (this one was pink with pastel polka dots), I purchased it, thinking that an extra would be useful. A family member found the same bunny in a larger size and it was given as a birthday present. 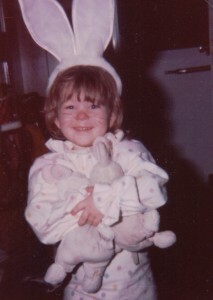 Though these extra bunnies were met with shrieks of delight, they never achieved true “Bunny” status and were set aside. Our mixed blessing caused us on more than one occasion to turn around and drive 45 minutes back to where Bunny had been left behind. Remembering to ask if we had Bunnies became part of our leaving-the-house-ritual. At times this was frustrating and we questioned why we allowed this toy to become so important, but other times we were thankful that Bunny was there to help soothe a very unhappy child. All was good, until the day the child realized there were TWO. We thought, “Crap, we’ve been caught; now we are in trouble.” We expected outrage when it was discovered. But no, the reaction was shock and then glee. Two bunnies was better than one and from that day forward, both bunnies traveled everywhere with us. Perhaps my views have been colored by some of my favorite childhood stories that show stuffed animals in a very human light. Both Corduroy the Bear and The Velveteen Rabbit evoke strong emotions in their stories of being loved by a child and stress the idea that no one wants to be left on a shelf. Every Christmas, we watch Rudolph the Red Nosed Reindeer and look forward to the residents of the Island of Misfit Toys finding new, loving homes. It is clear that for generations, children have grown attached to inanimate objects and put great value on them. Though there are some who say that allowing children to grow attached to a particular toy, blanket or other item is a bad idea, in fact, these things help children to adjust to new situations. In their familiarity, they provide comfort. Trusted child expert Dr. William Sears says that developing such an attachment to these “transitional objects” is healthy. He explains that young children are learning to attach to things as well as people and that this helps them as they become more independent. I am old and I still love my teddy bears! I take them on trips with me and I’ve posed them in numerous places for photographs. I’ve painted their portraits and have written stories about them. Growing up is definitely overrated!! I agree. Some objects hold too many memories to ever part with. And growing up? My kids have recently realized just how overrated it is! So precious! My daughter has a pink blankie, and when we moved right after her fifth birthday, I decided to just leave it packed away in a moving box to see if she would notice. I mentioned this on Facebook, and I got some mighty strong feedback. The consensus was the child has the right to hold on to this personal object as long as she wants. Her decision. She had her blankie back that very evening! I found that these items were abandoned for a time then picked up again when needed. I held on to the bunnies at times to see if they would be missed. When they were, I handed them back. Eventually they went in a keepsake box. I passed my sacred Winnie the Pooh on to my own kids. I couldn’t go to sleep without him until I was about nine. He’s moved with me to five homes. Lovies rule! I have a couple special critters tucked away too.